Already Central Telecommunication Minister on occasion of successful completion of BJP rule in Center speaking to media in Press meeting that BSNL would offers Free National Roaming for Prepaid and Postpaid customers across the country from 15-06-2015 onwards. State run Telecom Company Bharat Sanchar Nigam Limited (BSNL) issues clarification on Free National Roaming in India under GSM Mobile services. In a statement BSNL announced that under Free National Roaming the incoming call facility while roaming is offered for One Year across the country. At the start, the service has been brought into effect for 1 year period. After end of One year period GSM mobile customers can avail this Free National Roaming by paying charges using Special Tariff Vouchers Rs.100 (+/-3) for Prepaid and FMC charges for Postpaid. 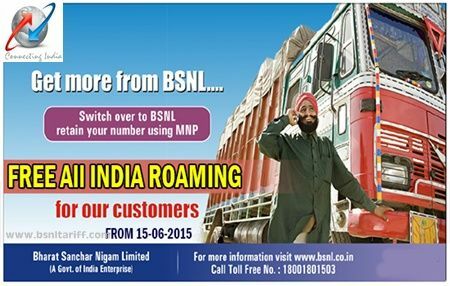 On the announcement of National Roaming BSNL has decided to withdraw the existing Free Roaming STVs Rs.5, Rs.33, Rs.69 and Rs.90 for Prepaid customers and FMC of Rs.61 for Postpaid customers. Following the terms and conditions BSNL will push the information to mobile customers through SMS.